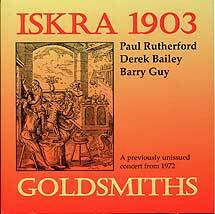 Derek Bailey, amplified guitar; Barry Guy, double bass; Paul Rutherford, trombone. Tracks 1-4 recorded at Goldsmiths College, London on 9 March 1972; tracks 5-6 location and date unknown. Front cover (reproduced above) facsimile of engraving on wood designed and engraved by J. Amman in the Sixteenth Century.